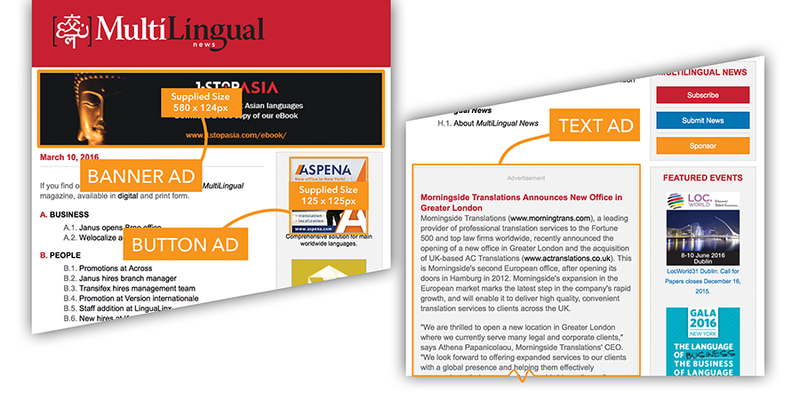 Distributed to more than 6,500 opt-in subscribers once a month, our digital newsletter MultiLingual News is an outstanding opportunity to reach prospects with a timely message. Newsletter advertising options are available for as little as $200. Each newsletter issue features the latest language industry news from around the world, an event calendar and much more. Topics are carefully selected from news submissions and independent research by the editors at MultiLingual Computing, Inc.. Readers know they can trust in MultiLingual News to inform them of the most relevant industry developments. Newsletter advertising provides you with the opportunity to specifically reach an industry-relevant audience. This is the best real estate in the MultiLingual News as it will be prominently placed across the top and contains a link to the web page of your choice. The button ad consists of an image as well as a brief written message. Furthermore, it contains a link to the web page of your choice. Considering the high efficiency of sponsored content, this text ad will give you the opportunity to share your message in detail to a relevant audience. Payments are processed by invoice. We accept US checks, wire transfers, PayPal and credit cards.